Tens of thousands of EU nationals living in Britain could become undocumented migrants after Brexit in a crisis bigger than the Windrush scandal, campaigners have warned as EU citizens now have until June 2021 to apply for settled status in the UK. The post-Brexit registration system is now available nationwide to an estimated 3.5 million EU citizens living in the UK. Europeans who want to stay must apply for settled status, and pay a charge of £65 ($83) for adults and £32.50 for children. The authorities will "deliver a system that will make it easy and straightforward for EU citizens to obtain status," Immigration Minister Caroline Nokes said. "The Windrush people trusted the Home Office and many of them got deported because they were citizens but couldn't prove it"
However, migration experts have warned that the post-Brexit system for registering EU citizens living in the UK could become a new "Windrush scandal". 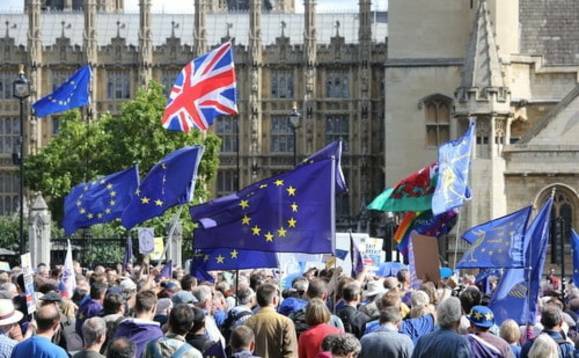 Maike Bohn, founder of the3million which campaigns for EU citizens in the UK to retain their existing rights after Brexit, warned trust in the government was low. "The Windrush people trusted the Home Office and many of them got deported because they were citizens but couldn't prove it," she told The Guardian. In the recent Windrush scandal, long-term UK residents from the Caribbean were deported or detained because they could not produce documents to prove their right to live in the country. The think-tank warned that vulnerable groups like the elderly, people with limited English or IT skills, or people isolated from the wider community may be particularly affected. The government insists it has learned the lessons of the Windrush scandal and will support applicants to show their residency using a wide range of different documents. The scheme requires applicants to prove their identity by using a mobile app which is part of an integrated online application process, which requires users to upload documents, answer questions and submit photographs of themselves using a smartphone. Further criticism was levelled at the government over an app designed to process applications that can only be used on Android smartphones and tablets - cutting out Apple's popular iOS devices. Other registration methods are available. Chai Patel, legal policy director at the joint council for welfare of immigrants, said: "EU citizens who do not pay to apply for settled status by 2021 will lose their right to live in the UK and become undocumented. "This is a major obstacle in the way of achieving the government's promise that every EU national currently in the UK will be welcome after Brexit. By charging a fee and by setting a time limit for applications the government is making it certain that some people will not get settled status. "And with 3 million to 4 million people needing to register, that means creating tens or hundreds of thousands of undocumented migrants overnight. The poor, the elderly, [and] those with illnesses or disabilities will be particularly affected as the government is failing to set aside enough resources to help them. "We therefore urge the government to do everything in its power to make sure everyone's rights are protected after Brexit. Instead of creating a system that defaults to removing rights if a person does not pay for an application, the government should today grant a free and permanent legal right to stay to all EU nationals resident in the UK. "The Home Office should then provide a free and simple process by which people can obtain documents proving that right." Charities said that the fee to register, although "not huge", would also deter some people from applying, and criticised the Home Office for refusing to introduce a fee waiver for those who may not be able to afford it. Theresa May has just announced she will be scrapping this fee. Liberal Democrat MP Sir Ed Davey said: "No one seriously believes that the Home Office will be able to grant settled status to everyone who's eligible within two years. Thousands will be left effectively undocumented and subject to Theresa May's hostile environment." Those who have lived continuously in the UK for five years can apply for settled status under the scheme, meaning they are free to go on living and working in the UK indefinitely. People who do not have five years' residence can seek to stay until they have, at which point they can apply for settled status. In a pilot run of the scheme at the end of last year 29,987 people made an application for settled status, of which 27,211 have already received positive decisions, with no refusals.